In truth, this sauce is more of a plant-based Béchamel or white sauce, endlessly versatile (think moussaka, lasagna, casseroles, potatoes and more). To make it more like a traditional Alfredo, stir in half a cup of nutritional yeast to give it a touch of that Parmesan flavor. Either way, this is a highly nutritious, guiltless alternative when you want a rich, creamy, velvety sauce. In a medium saucepan, sauté the garlic over medium heat for a few minutes. You do not need oil, but you can add a few drops of water if necessary. Add plant milk and switch to high heat. When the milk boils, add the cauliflower, salt and pepper and lower to medium heat. Cook until the cauliflower is tender, about 15 minutes. Blend the cauliflower mixture with an immersion blender or in a separate blender until you achieve a smooth and creamy texture, without lumps. Incorporate additional milk if necessary, to adjust the thickness of the sauce to your liking. Boil the pasta. 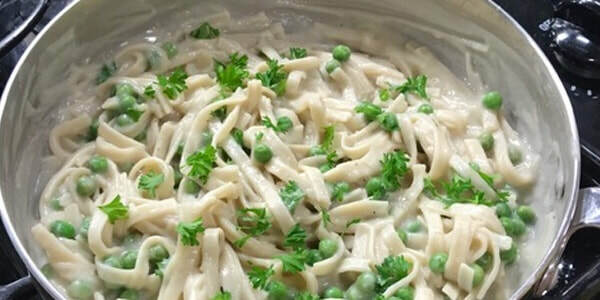 In the last minutes of cooking the pasta, you can add some peas or another vegetable of your preference to the pot, such as red peppers, broccoli, grated carrots, mushrooms or other. When cooked, strain the pasta and vegetables, and combine with the sauce. Serve the pasta, decorating each portion with freshly minced parsley and sprinkle with paprika.